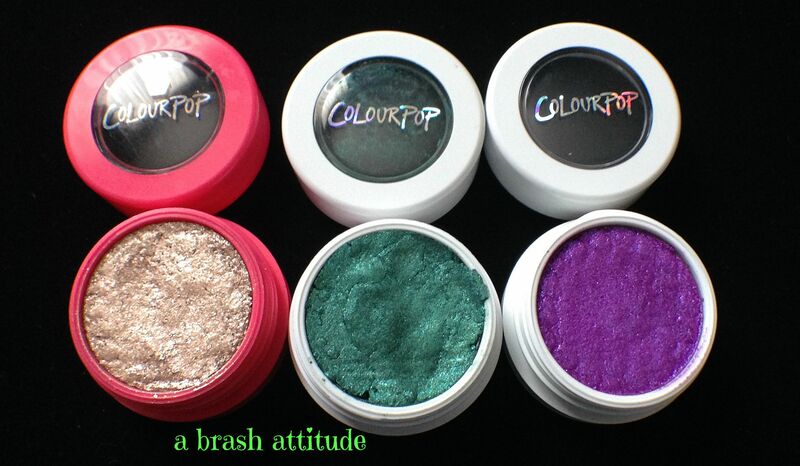 Ok, back to my review: These three ColourPop Super Shock Eye Shadows were also a part of my very first ColourPop order, I blogged about the Lippie Stix here. I was lucky enough to receive their limited edition shadow “Birthday Girl” as a gift with purchase as part of their birthday celebration. 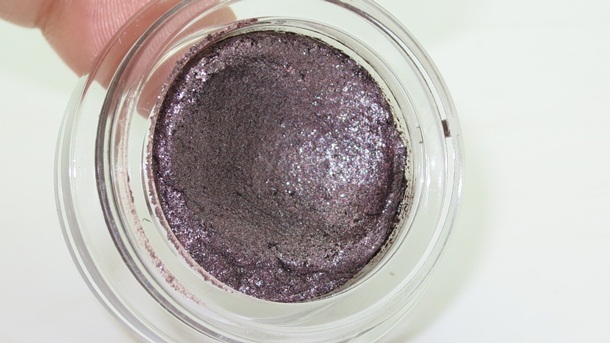 Birthday Girl – since this one is not listed on the website, I will describe it as a bronzey gold shade, very glittery, but very wearable. 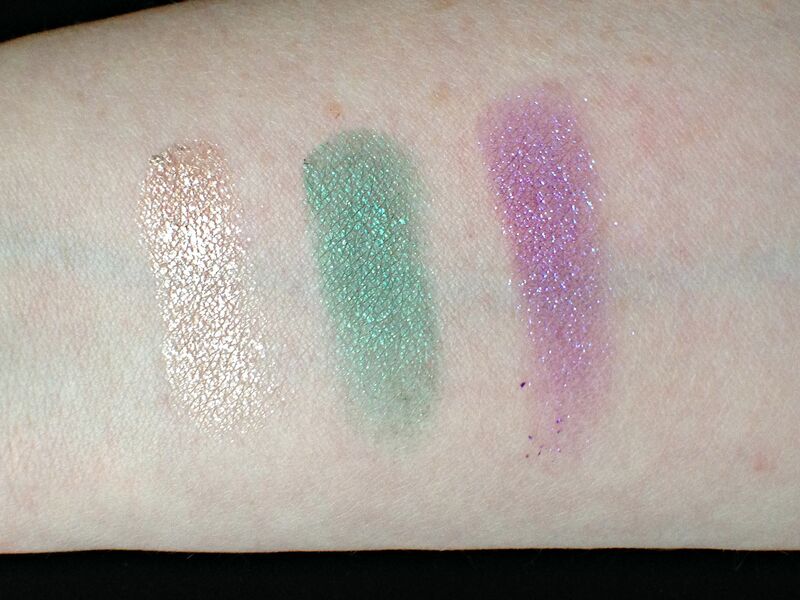 My photos do not do justice to the depth of colour that these three Super Shock Eye Shadow / Pigments have! I’m still getting the hang of applying them since I’ve only ever used pressed powder shadows or loose pigments. The texture is so weirdly sponge-like. I get better colour payoff when I apply using my fingers so far. Empire was cracked when I opened my package, I was sad at first, but some google-fu helped me figure out how to re-press it so I wouldn’t risk it falling apart every time I opened it. Overall verdict – great pigmentation, AMAZING price, long wearing (not sure if it is due to the shadow or the combination of eye primer plus shadow), slight learning curve in application. I will definitely buy more if the exchange rate ever improves! You can buy ColourPop on their website. They are adding more countries that they ship to all the time. 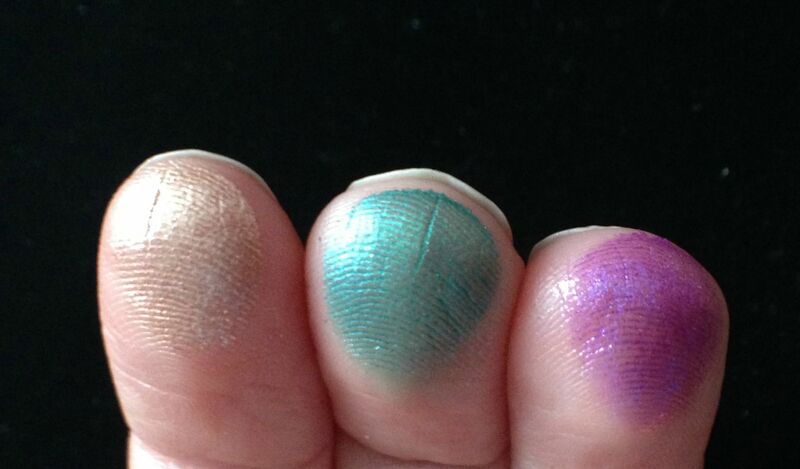 These look so pigmented! Wow! I’ve heard a lot about them and all the photos I see they all look amazing! Colourpop is an excellent brand, I really love them. =) Fingers apply it really well, but for me, I get the most pigmentation when using a stippling brush and kind of digging them out, layering them on, and then buffing them in a windshield wiper motion until completely smooth. Ooh, I haven’t tried them, thanks for the info! I keep hearing so much about these! I need to try them! Daena, I know you will love them! It is so good, I’ve been trying to get this colour for so long!!!! Pretty!! I’m dying to try ColourPop! The colors look so rich and pigmented. I can’t wait to try some more! I would place my second order right away if the exchange rate between CAD and US dollars wasn’t so high! I really want to try some of the liquid mattes and the blush / highlighters. I love, love, love Birthday Girl! The colors are all so vibrant. I love them all, if the exchange rate wasn’t so high I would place another order right away! I know, the exchange is killing me! I love your blog, you’re always introducing us to new, amazing products! That bronze-gold shade is so beautiful, I like the others too, I just think I’d reach for that one a lot more!! I just placed my first order and I am SO excited! I’ve not really heard any negativity regarding ColourPop and their products, so I am so so looking forward to trying them. Thanks for the lovely review! I don’t have any colourpop supershock anything *LOL* It looks amazing! I’m rather convinced after reading your review. They’re really good, but there is a slight learning curve to application! They work best with fingers or synthetic brushes.